MANILA, Philippines - The October 2017 Chemist board exam results including the official list of passers, topnotchers (top 10), top performing schools and performance of schools were released online on Wednesday, October 18 or in 2 working days after the exam. PRC said that 526 out of 1,195 passed the Chemist Licensure Examination. 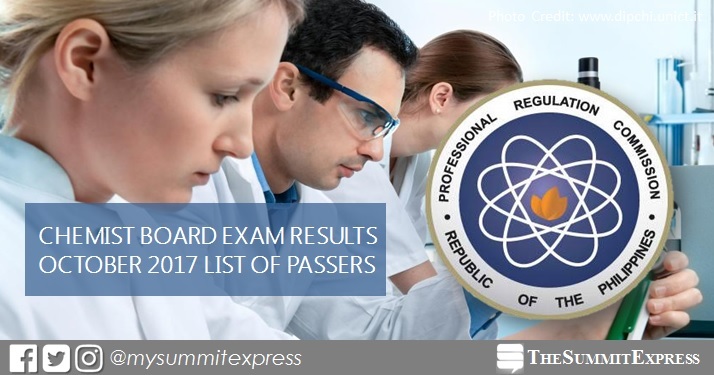 The Professional Regulation Commission (PRC) conducted the licensure exam in the cities of Manila, Cagayan de Oro and Cebu on October 10 and 11, 2017. From October 23 to 24, registration for the issuance of Professional Identification Card (ID) and Certificate of Registration will be done on-line. Please go to www.prc.gov.ph and follow instructions for initial registration. Chemist board exam's verification of ratings (passers, non-passers and removal) can be done online. The two-day examination covered the following major subjects: inorganic chemistry (25%), organic chemistry (25%), anytical chemistry (25%) and physical chemistry (25%). According to PRC Resolution No. 2016-1019, the target release date of the recent Chemist board exam results is on Monday, October 16 or in 2 working days after the test. UPDATE: The Malacañang Palace announced the suspension of government work for Monday and Tuesday, October 16-17. With this, results may be released on later date, possible on the following day. In the same period last year (October 2016), results were released in 2 working days. A total of 559 out of 1,019 passed the exams. Monitor this page for the real-time updates on Chemist board exam results. Check out also the official website of PRC for more information.